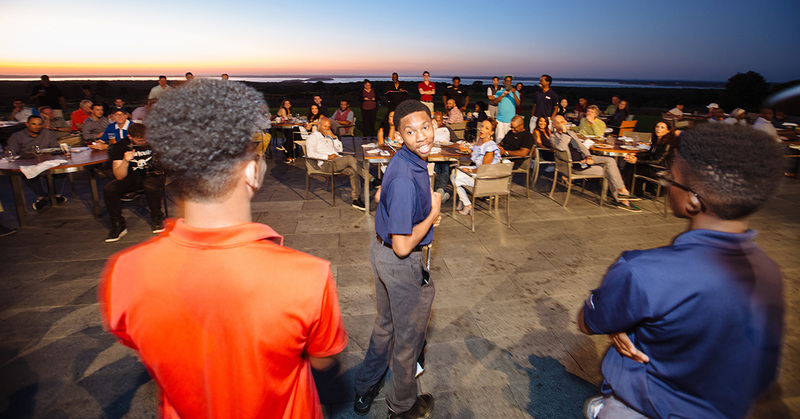 Dameul McGill was right where he likes to be, front and center, when he and his peers presented the prizes at this year’s fundraising outing at The Bridge. This month we meet Dameul McGill, a 14-year-old sophomore who aspires to a career in the fashion industry. He recently fielded some questions from Charlie Hanger, the digital content manager for The Foundation and Learning Center. CH: Where do you live, and who are the important people in your life? DM: I live on the Lower East Side of Manhattan with my mother, my sister and my grandmother. Sometimes I stay with my pops in the Bronx too. CH: Who is someone you admire, who has had an impact on your life? DM: I admire my grandmother because she’s very reasonable and she always takes the time to think before she acts. If she’s in a difficult situation, she thinks about her options instead of jumping to the first one that she sees. Because I grew up around her, I’m pretty relaxed and I’m not hotheaded. I try to be rational and reasonable and not act up because of my emotions. I try not to let my emotions get the best of me. CH: What do you want to do when you grow up? DM: I’m interested in many careers, but the ones that spark the most interest in me involve art, design and fashion. My whole life I’ve been raised to know that I have to get a job and support myself when I get older, so why not do something that’s really interesting to me, that I’m really passionate about, and that can allow me to make a lot of money? I’ve designed lots of things — accessories, shirts, shoes, caps, jackets and even book bags — but I haven’t had them made yet. Most of the things I create incorporate things I’ve grown up with, like old anime cartoons where I’ve added my own twist. For example, one of my shirt designs has a version of Naruto painted on the back, but with a hairstyle I used to have. CH: How do you feel about taking on the business side of the fashion world? DM: My favorite class right now is called Mind Your Business, which focuses on economics and business. We get a sense of how to manage our money and how to establish our own businesses and how to make sure they do well in the long run. You get a sense of how to organize your money and prosper over the years. It’s like on “Shark Tank,” they’re always talking about royalties and equity. If you know about those things and other business concepts, you’ll know how to take care of yourself when you get into the working world. I want to start my own business someday, but I have to start somewhere, so at first I’ll be focused on finding a job so I can get the money and experience I’ll need in the future. Different jobs give you different tools you can use in future, and also connections to people who may be able to help you one day. CH: What are your hobbies? DM: I skateboard and play basketball. In addition to designing clothes, I draw, watch anime, play video games, write and cook. I used to watch a lot of basketball, basically wherever Blake Griffin was playing, but I mostly watch X Games now. CH: What do you like to cook? DM: One thing that I know how to cook is pork chops. When I get in the kitchen, it’s going to taste good, you know that. You have to make sure you have the correct seasonings and make sure when you pick the pork chop it’s clean, and then clean it again at home. My favorite is to bake them. CH: What is your favorite thing about the Foundation? DM: Everyone has things they need help with, and everyone has things they’re good at, but we’re all in the same setting, so we can help one another. For example, I’m good at presentations and making PowerPoints, and I was able to help kids with that software and other stuff like Google docs. In golf, my backswing used to be really fast, but one of my friends, Antonio, taught me how to slow it down, and now my stroke is much smoother. CH: What is your favorite trip or experience since joining the program? DM: The first time we went to The Bridge in my first year. It was fun and we got a chance to meet Mr. Rubin and see the club, which has an entire golf course, several chefs, a workout area, and a Formula 1 simulator since the property used to be a racetrack. And with all the art there, it’s like a museum.